React has 4 extra Page templates. Contact page – Displays contact information, map and a contact form. See here for more details. FullScreen Media – Displays Video or Image slide show as the background with no other content. See how to add Backgrounds for this. No content style – There is no content area on this template. Only headers, footers and sliders. See how to add Backgrounds for this. Note Block – Displays Video or Image slide show as the background with a small content box. See how to add Backgrounds for this. 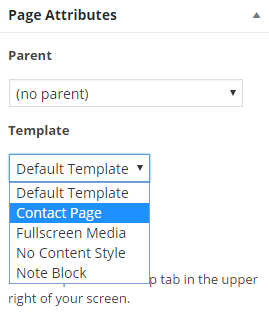 Add a new page in WordPress and, at the right-hand side where there is a box named Page Attributes under Template, choose Contact Page.